I challenge someone at BYOB to chug a Rockstar against me. EDIT: No screw it, Rockstar tastes terrible... let's make it something else. Tada, you pick the drink, and I'll drink it. I haven't timed myself, but I can probably make that range. As long as the BYOB is an all-nighter I'm up for it. PS: You made your own emoticon? Awesome! I challenge someone to tell me how to make your own emoticons ^_^! -Also on a DDR related note, someone go for a FC on PARANOiA Survivor. Particularly someone who doesn't own 13 footers everyday. but how do you get it to show up as an emoticon? To take out a background, just use the magic wand on the bg and Delete it. If you're using smilies or something like that, make sure Anti-Alias is off first. then someones going to use it like "so yeah, a girl turned me down today "
hm.... but then again someone could be all like "yeah, i 99'd pandemonium expert "
IT'S SO ON THIS SATURDAY. I'll chug the Tabasco, FC PARANOiA SURVIVOR, and ATTEMPT Pantsu's Determinator score. 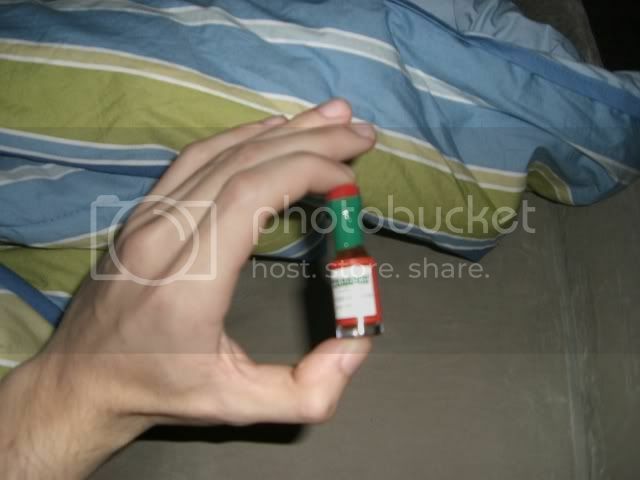 Seriously, Tabasco isn't hot, and as long as you lie to yourself that you're not burning up, it's easy. Eastern mantras ftw. PS isn't hard to FC. I might even get it on video if my dad isn't busy. But the Determinator one. Dang, my score is a lot less than Pantsu's current one, of course I haven't played it in a while. I WILL try this though. MIKE THATS WAY TOO SMALL. Get an S on You Can't Do It EXT on drummania. MSPaint, upload to photobucket, flickr, or whatever.